In this post, I cross the Potomac to visit Alexandria, VA and look at contracts closed in February in zip code 22314 using data released by MRIS. The zip code is roughly bordered by the Potomac River on the east, I-495 on the south, N. Quaker Lane / the Metro rail line on the west, and Janneys Lane / Route 7 on the north. Old Town Alexandria is located in this zip code. 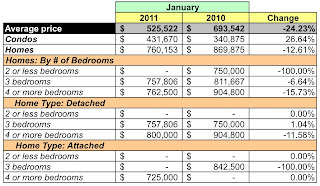 Compared to the same month in 2010, aggregate dollar volume was significantly higher, up 75.08%. The number of units sold rose 54.55%. The average sales price increased 13.29%, but the median sales price was a smidgen lower, down less than 1%. In terms of units sold, it was almost evenly divided between homes and condos. Condos accounted for 23 of the 51 units sold. The number of condos sold was 27.78% higher compared to February 2010. The average price for a condo was down 1.53%. 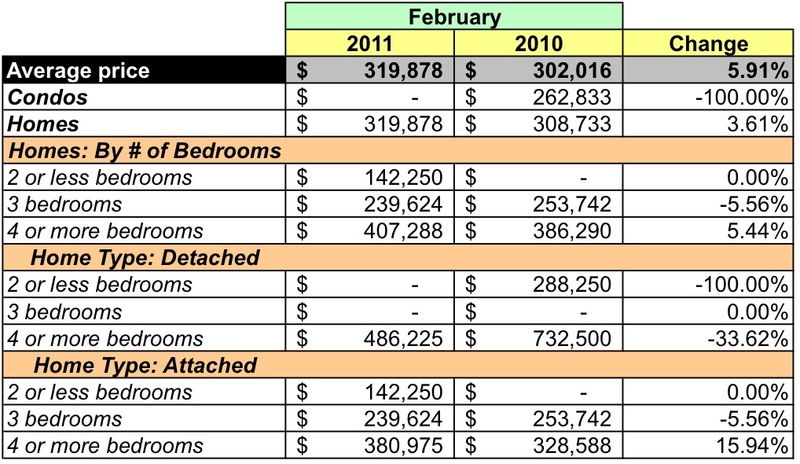 While unit sales were almost evenly divided, homes trounced condos in dollar volume. 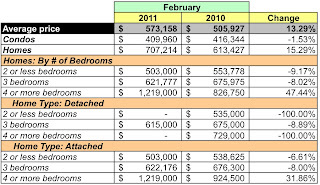 Homes represented about two-thirds of the dollar volume in February 2011; not really surprising since the average price of a home was 72% higher than that of a condo. Twenty-eight homes were sold, an 86.67% over February 2010. Average prices rose, too, up 15.29%. Three bedroom homes dominated that segment of the market. 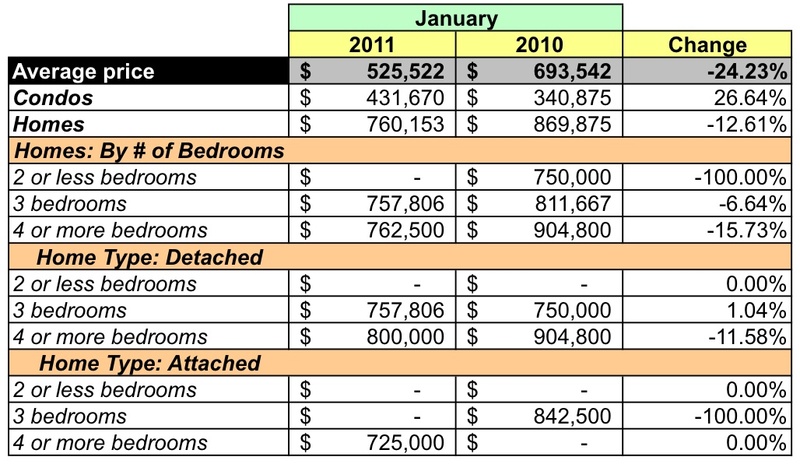 Two attached 4 bedroom homes sold for more than $1MM; one for $1-2.49MM, the other for $2.5-4.9MM. Condos topped out at $800K, with 4 selling between $600-799K. In February, zip code 22314 represented 50% of Alexandria's dollar volume and slightly less than 37% of unit sales. In comparison to Alexandria as a whole, its average price was 35.55% higher and its median price was 33.59% higher. At February's sales rate there's a 3.65 month supply of condos and 3.89 months supply for houses listed in 22314. 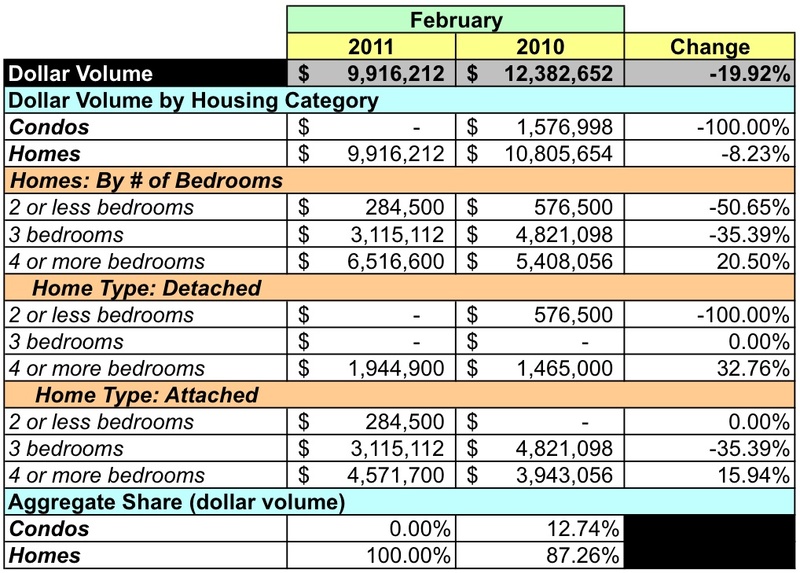 When I look more closely at the market by segmentation, it's a sellers market for all segments listed under $1MM. Above $1MM, I'd say those folks selling a home in that pricier segment will have a tougher time. Thirty of the 109 homes with active listings are priced at $1MM or more. Based on February 2011's sales, that's a 15 months supply. Nine of the 84 condos listed are priced at higher than $1MM. The market in 22314 is recovering from its 2008 low, but it hasn't yet returned to the glory days of 2007. More homes closed or went under contract in February 2007 and, interestingly, fewer went under contract with contingencies. The most critical factor in this February's better performance was the sale of 17 attached homes with 3 bedrooms and 5 attached homes with 4 or more bedrooms. In unit terms, these were increases exceeding 400% and with their higher average prices, they made a huge contribution to the total dollar volume closed last month. My armchair analysis is that if you're looking for a home or condo in 22314 that's priced under $1MM, fast action and financial preparedness on your part will be important. If you can afford the pricier things in life, time may be on your side. In this post, I look at January sales recorded for DC zip code 20002 using data released by MRIS. That zip code is roughly bordered by East Capitol Street on the south, North Capitol Street on the west, the Anacostia River on the east, and New York Avenue NE on the north. A wide variety of neighborhoods are encompassed within those borders: Bloomingdale, Capitol Hill, Eckington, Trinidad, and Gallaudet University. The hot H Street NE corridor is in this zip code, too, so I'm sure a lot of residents, wanna-be residents, and developers are interested in how the market's performing. YoY, aggregate dollar volume rose 54.7% and the number of units sold inched up 15.38%. The aggregate average sales price was up a healthy 34.07% and the median sales price was 40.61% higher. Condos are a mere blip in the 20002 housing market. In January, they accounted for 4 of the 45 units sold, translating into a little more than 4% of the dollar volume. The number of condos sold in January 2011 was about half that of January 2010. The average price for a condo was down by almost a third, down 29.56%. Homes had a good month. Three bedroom homes dominated the market, representing slightly more than half of all homes sold. YoY, dollar volume almost doubled, up 81.02%. Unit sales were up 32.26%% and the average price rose 36.87%. No condo sold for more than $400K (!) and one home sold for $1MM-2.49MM. All told, 15 homes sold for more than $500K. In January, zip code 20002 represented 11.14% of DC's dollar volume and 11.81% of unit sales, metrics close to that of zip code 20009. In comparison to the District as a whole, its average price was 5.69% less and its median price was 11.99% higher. I suspect that if the $1MM-2.49MM home were excluded from the mix, the average / median prices for 20002 would be much lower. At January's sales rate there's a 14.3 months supply of condos and 3.44 months supply for houses listed in 20002. A seller's marketing for those with homes. If I were to characterize 20002 based on this data, I'd say it's a zip code where homes, not condos, dominate the market and average prices are lower than that of the District as a whole. 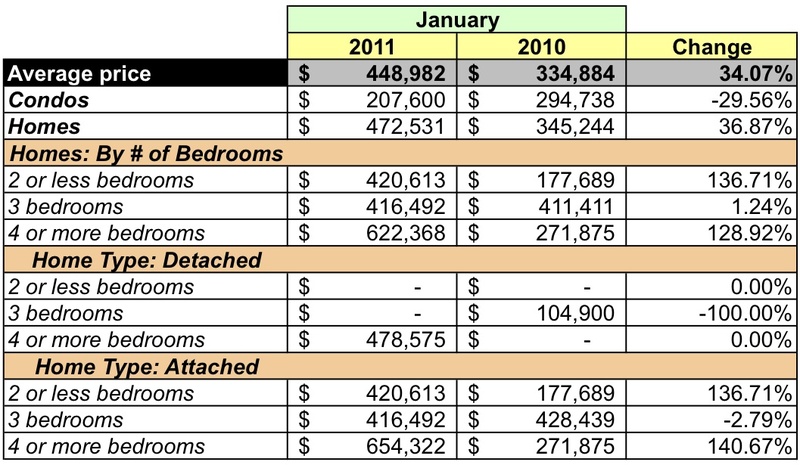 In particular, attached homes (e.g., rowhouses) dominate unit sales and have experienced huge increases in dollar volume and average sales prices, with average prices for 2 bedroom and 4 bedroom homes increasing more than 100% compared to January 2010. That being the case, anyone buying in 20002 should understand that with homes selling fast and prices increasing, they have to move fast when they find the right home.